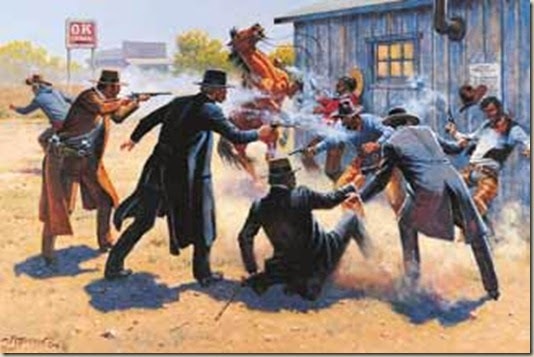 The outlaws had been on a run of numerous assaults to the laws of the land while holding high ranking positions of leadership within the town. During the previous year alone, the corrupt five had allowed the local bank to be sacked of the peoples money fifty-eight times. Town-Folk as well as admirers were tired of being assaulted and insulted ! They sent word to the Governor Stephen (William J Lepetomane) Ross, and demanded change! Ross obliged with the termination of Mayor Jeff (Hedley Lamarr) Ireland, and the forming of a good character chasing, white hat wearing mob. The appointed Dolphins Posse Leader Dennis (I'm your Huckleberry) Hickey along with Partners Joe (Earp) Philbin, and Dawn (Kitt) Aponte rode into Miami with the intent of ridding the passionate town folks of the bad boy gang. With guns a blaze'en, they permanently exiled offenders Richie (Mongo) Incognito, Jonathan (Squeeky) Martin, and John (Marshmallow) Jerry. Other lesser involved suspects that include Bryant McKinnie, and Tyson Clabo are being tracked for potential questioning of future urgency. Upon the retaking of righteousness in Miami. Hickey brought in hired guns of fortune with the likes of Brandon (Lefty) Albert, interior tough guy Shelly (The Gate Keeper) Smith, and Jason (The Sly T&G) Fox. As the news of good things to come spread throughout the territory, others of high character came along to seek roles of leadership. Those warriors of good include drafted Volunteer Ja'Wuan (Right Hand Man) James and his 49 consecutive gun fights from the right side. A drafted consecutive 30 games starting left tackle out of North Dakota State, Billy (The Bison) Turner projects to become an NFL five position trick shooter and/or main attraction. The durable, interior pivot player Tyler Larsen of Utah State has 51 consecutive games started at Center as a four year offensive line shot-caller. Beyond the above mentioned the Dolphins also acquired Arkansas' David Hurd who was a 2012 thru 2013 starting left tackle for the SEC's Razorbacks. During the 2012 season he, his line mates, and team broke twenty Arkansas and/or SEC offensive production records, (for the most part) via the passing game. Another addition was New Mexico States Davonte Wallace and his 48 consecutive starts over four years, for the most part at left tackle. He stepped in on day one along side established veterans, and almost immediately became the teams best lineman while having to adjust his game for a plethora of Aggie offensive line coaches over the years. Of his college career Davonte said, """First of all, it was very scary, I was a skinny little nothing. Wasn't very strong. Just did things right. Took coaching. Whatever they told me to do, I did it. If I didn't understand it, it's something I'd ask them over and over. I kept doing stuff over and over, until I got it right. That's probably how things turned out the way it did."" Something that ""Squeeky"" might have considered? Too boot. The Miami Dolphins retained the rights to the NFL elite center Mike Pouncey, and pre-determined 2013 backups of which received invaluable playing and/or starting experience repetitions last year. Those got'your'back guys are Dallas (G/T) Thomas, Nate (G/T) Garner, David (T/G) Arkin, and Sam (C/G) Brenner. All in all a bunch of shiny new badges have been pinned to chest. The currently unemployed 34 year old 2013 left tackle McKinnie has been replaced with an All-Pro 29 year old Brandon Albert. Right Tackle/wanna-be Left Tackle Squeeky Martin won't be missed what so ever with the signing of the penciled in studly right tackle Ja'Wuan James. Marshmallow Jerry is easily upgraded with Shelly Smith. A 30 plus Tyson (The Matador) Clabo's roster spot goes to Jason Fox (26) as a starting guard or backup tackle. The self appointed Mongo badge and remaining Offensive Line roster spots will be earned by new comers and homesteaders Billy Turner, Tyler Larsen, Evan Finkenberg, David Hurd, Davonte Wallace, Michael Ola, David Arkin, Sam Brenner, Nate Garner, and Dallas Thomas. Famous Blazing Saddles/Hedley Lamarr quote; ""My mind is aglow with whirling, transient nodes of thought careening through a cosmic vapor of invention."" Yea, Yea, Yea, I know what your thinking : ))) !!! After the smoke clears from the shootout at the JRS corral. How do you feel about who might remain standing compared to those buried with their boots off ? Thank You for an Open Minded Read, and we look forward to your angle of view !